Since its founding in 2009, Uber has grown to be valued at more than $18 billion. It’s one of the fastest growing startups in the world. If you’re not familiar with Uber, they’re a ride-sharing company that allows people to easily grab a ride in most major cities across the United States (and abroad – I used an Uber in Amsterdam just a couple weeks ago). But unlike a traditional taxi cab service that has a ton of overhead (the vehicles themselves, the structures to park and service the vehicles, the union workers, etc. ), Uber simply uses technology and software to connect the dots between the owner of a car who wants to make some extra money and the the person who wants a simple, clean, painless ride to the airport. Great idea, sure, but that doesn’t explain the rapid growth rate. Early last year, before heading abroad for my second around the world work-cation, I met my friend Ryan Delk of Gumroad in San Francisco for a coffee. After a great chat about ecommerce, digital products, San Fran coffee and hipsters, we parted ways – but not before he offered to pay for my ride using a coupon code from Uber. You see, every time someone signs up for Uber, they get a coupon code for a free ride (well, at least up to $20 at this time) to give to a friend. So of course I was going to sign up on the spot, use the coupon, and get (most of) my ride taken care of. And after that, I had a free coupon I could give to someone else. That’s what people in the startup space and digital marketing world call a growth hack, and it’s the type of modern-marketing-meets-tech that’s allowing companies (and individual artists, authors, and entrepreneurs) to create some massive results with very little effort. So the question is, how do the underdogs like you and I take advantage of growth hacking, especially if we don’t know how to code? Enter Jeff Goldenberg, Head of Growth at Borrowell.com, and Mark Hayes founder of Tiger Tiger Digital Agency. 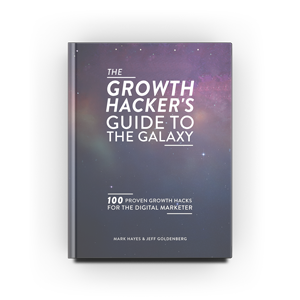 They’ve written a new book on growth hacking called The Growth Hacker’s Guide to the Galaxy, which shares 100 proven growth hacks that anyone can use, even if you’re a non-technical marketer / founder / author / model / actor (and not the other way around). Jeff agreed to share with my audience what it means to growth hack, so please be cool and share!! 1. What is growth hacking? Growth hacking can be thought of as advanced digital marketing, but is a much more holistic and product focused than just simply marketing. Growth hacking attempts to find a repeatable and cost efficient CPA lower than industry averages, so you can grow faster and for less money. It gives smaller and smarter companies the ability to compete against competitors with much bigger marketing budgets. It combines technology (mainly automation), data and creativity to produce effective digital marketing. 2. Who should care about growth hacking? Anyone trying to grow anything. Whether it’s a small business owner trying to get more customers, and author trying to get more readers, or a startup trying to break the $1million mark, growth hacking can help. In reality, growth hacking is a form of marketing but with a primary focus on the bottom line – and we all need to be marketers in this day and age. The good news is it’s never been a better time to be a marketer. Marketers who want to collaborate more holistically and effectively across multiple divisions like sales, marketing, product, customer service etc. New marketing grads should focus on growth hacking to have marketable marketing skills over the next 3 years. And startups, who can’t compete based on budget, should study growth hacking to be competitive. 3. What’s an example of a growth hack for a person trying to get attention for his new book, business, or blog? Pre-marketing – use lead generation hacks, lead nurturing hacks, email automation hacks and social media hacks to build up a following ahead of launch. There’s nothing harder than marketing on day 1 from zero. 4. What is an example of a growth hack for someone trying to get more sales of a product or service? Effective e-commerce hacks can include advanced cart abandonment promotion, automated blogger, and PR outreach and experimentation with referral and affiliate programs. All of these have proven to have good lift with e-commerce companies. UI/UX is also a key driver, so should be experimented and tested accordingly. 5. What is an example of a growth hack for a bootstrapper trying to build an SaaS company from scratch? I’d focus early on blogger and influencer outreach, because there are so many new SaaS companies that getting influencer credibility is a huge help early on. Identifying key influencers and automating flows to reach out to them more effectively are a good place to start. Also, engineering as marketing is key, and if you can build virality/marketing into the platform, it will be easier to spread. 6. What is an example of a growth hack for an author trying to sell more books? The key to selling more books is simply marketing and promotions. You need to get as many eyeballs on the book as possible. Use BuzzSumo to identify the influencers in your space, and automate outreach to them, but in a personalized, one-to-one way (yes, it is possible to automate and appear to be one-to-one). 4. What are some of the bonuses you’re offering alongside the book in your Kickstarter (and why should I care)? We are offering our time (mine and Mark’s) to help companies execute and integrate their hacks into their companies. We hope to work with some of our readers to help them grow their businesses, either remotely or in person. We also are offering technology companies (that can enable a killer growth hack) to pledge and be a part of the book as a featured growth hack or a case study. I Want More Growth Hacking! Don’t worry, I’ll feed you baby bird. 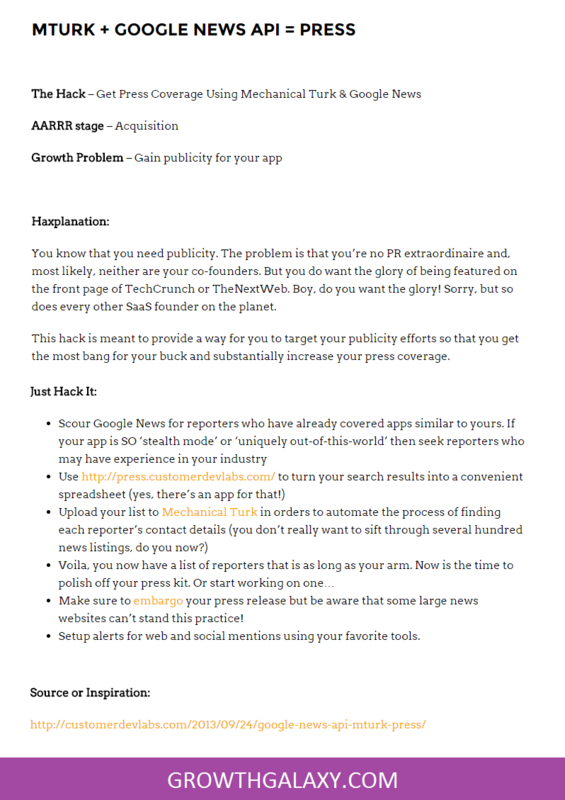 Check out The Growth Hacker’s Guide to the Galaxy exclusive through Kickstarter right now. The book itself is a comprehensive guide and resource for anyone trying to take their art, writing, or business to the next level. In it, the authors, Jeff Goldenberg, Head of Growth at Borrowell.com, and Mark Hayes founder of Tiger Tiger Digital Agency, have deconstructed 100 proven growth hacks used by some of the fastest growing companies in the world, and reconstructed them in simple to follow, step-by-step instructions. Now, normally, growth hacking is something pretty advanced – most growth hackers have a background in engineering and use code to create these type of insane results. But The Growth Hacker’s Guide to the Galaxy is being written for the NON-TECHNICAL marketer / startup / entrepreneur – anyone who still wants to leverage complex marketing tactics, without the complexity. You can support the Kickstarter crowdfunding campaign here (and get some awesome bonuses while you’re at it). This is exactly what I hate about the GH movement. Every single one of these examples is EXACTLY traditional marketing. Not a single example here hasn’t been used by every single shopper marketing or loyalty marketing company/agency/pro for the last twenty years. I’m glad people are re-learning these lessons, but the movement is just uneducated non-marketers learning marketing. Glad it’s happening, but the “omg this is so new” stuff needs to end, lest GH becomes guerilla marketing, aka: a ridiculed tactic that nobody wants on their resume. Jeremy, haha – very true. I wouldn’t put guerrilla marketing on my resume either. But since growth hacking is a trending new term – and many, many companies are looking for people who can truly grow their companies (which takes a combination of marketing, understanding of product development, and engineering), it’s an important difference from traditional marketing. Great post as always – thank you! 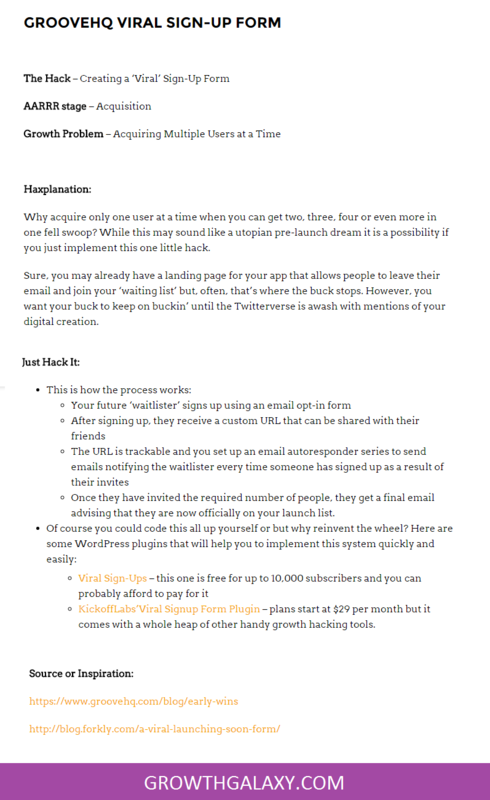 Just one thing – the link to the Viral Sign Up plugin is pointing to the growth hacker guide. Cheers! And I’ll double check that…we have that as a hack in the book, but maybe I can find the software we featured (like springsled for example). Ever heard of the book Eats, Shoots & Leaves? Great article, I’ve really learned a lot from it and I’ll definitely keep these growth hack tips in mind! What are your thoughts on tools like http://www.tweetfavy.com/ I’ve been using it to get more followers on my Twitter profile automatically, good stuff. You guys should check it out!